Blueberry Almond Scones for you today. A few weeks ago, a came across a recipe for Paleo Blueberry Scones. It was on the blog Fed and Fit. She has lots of great recipes! Definitely check her out! I have been craving scones for while now. These were so delicious and I can see so many variations on this recipe in the future. I deviated from the original recipe a bit, and I think it came out great! If you enjoy blueberry recipes this time of year, you may also like my Blueberries and Cream Popsicles or my Banana Blueberry Muffins. I love almond extract, so I try and add it whenever I can. I went so well in these blueberry almond scones. I also made mine vegan by using flax eggs. I loved that the original recipe called for cashews as a base. You all know I love making all my flourless cookie recipes with cashews! I hope you enjoy it this as well. 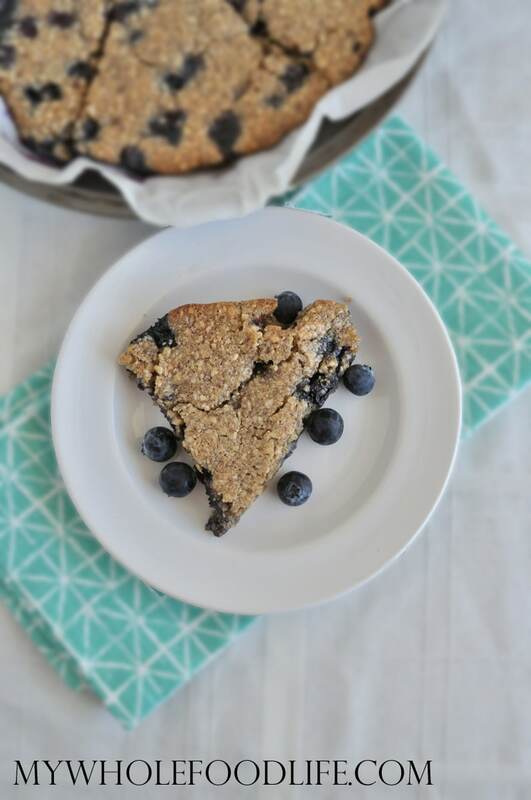 Delicious Blueberry Almond Scones that are vegan, gluten free and paleo! In a food processor , process the cashews into a powder. Add them to a bowl with the rest of the dry ingredients. In a smaller bowl , mix all the wet ingredients. Add wet to dry and mix until combined. I did this by hand with a spatula . Line an 8 inch round pan with parchment paper. Let cool completely before cutting into slices. I used a pizza cutter to cut mine. Store the scones in the fridge. They should last about 2 weeks that way. Enjoy! Recipe adapted from here . I was just wondering how much cashew meal you would use that's already ground up. I have some meal and I want to use that up before using up my whole cashews. Thanks! Love your blog!! Oh my gosh, these were the bomb!! I used 1 cup cashew meal and they turned out perfect! I cannot wait to find excuses to make these more often. Yay! Glad you enjoyed them! Is there anything I could use in place of arrowroot powder? Thanks! Can strawberries be subbed straight without any adjustments? I think they could. Maybe slice them thin? Same amount? I've made these before and they were fabulous! I'm thinking about adding banana this time since I have some brown ones. Do you think I need to adjust the amount of cashew meal to offset the liquid from the banana? Love your site. Awesome! Are you wanting to add banana in place of the blueberries? I think that work. I was thinking of using blueberries and bananas. These are fantastic! I made them with strawberries from our garden this morning instead of blueberries--delicious! All 5 of our kids loved them too--can't beat a kid approved recipe. Thanks! Yay!! So happy to hear that Jeannine!